he Freemason Abbey building was built and originally dedicated as a church in 1873 by the congregation of the Second Presbyterian Church. In 1902 the congregation sold the property to the First Church of Christ Scientist, who occupied the building until 1948. From 1948 through 1987 it served as a meeting hall for the Independent Order of Odd Fellows. 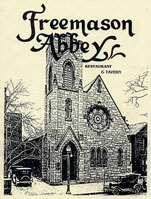 In early 1988 the planning of the Freemason Abbey Restaurant and Tavern began. The renovation continued each day with a strong sense of pride, enthusiasm, and dedication. Our skilled craftsmen changed the 142 year old structure into an exciting eating and meeting place for all to enjoy. A completely refurbished “back building”. Now our clean, efficient kitchen facility designed to produce deliciously attractive meals, one at a time, and up to two hundred per hour. Removal of two false ceilings, which exposed the voluminous cathedral roof trusses. Construction of the steel framed mezzanine seating nearly one hundred guests, comfortable restroom facilities, a cozy lounge and bar area, and the new etched glass, wood framed windows on the east wall. Our decor is designed to create a warm, casual, tavern atmosphere. The menu expresses a variety of items for almost any occasion to eat out. Whether you come in for dinner before the show, a cocktail after work, a quick lunch, or a light supper on any old Tuesday, we will always appreciate you as a special guest. Sit back and relax, expect friendly service and great food. Our staff is ambitious and very eager to make your visit one that you will tell your friends about.